Jerry Clark remembers it clear as day, like it was last week. Kentucky-man Clark spent the most of his first twenty or thirty years, or more, working for his friend Earl Hayden, or helping Earl as best he could. 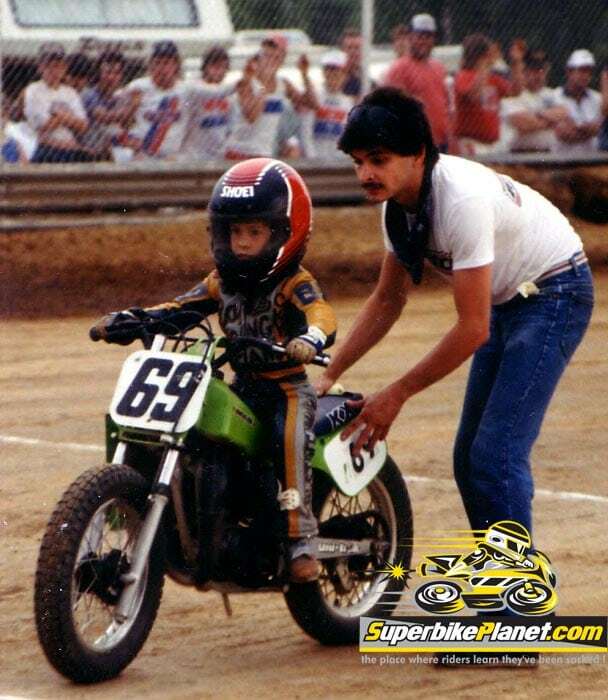 Clark worked for Earl’s car lot and then transitioned into maintaining Earl’s fleet of family race bikes while all the Hayden kids raced amateur dirt track races. There were endless oil changes and tire swaps and assorted crash repair jobs that kept him busy, working out of a shed on Earl’s Lane or in the garage, most days. Clark’s memory goes well back into Hayden family history; he remembers when Earl himself raced and when Roger Lee and the other kids were born. He’s eaten probably a thousand meals with the Haydens, traveled with them and witnessed nearly the entire male brood go from diapers to dirt track to Superbike racing. Earl was running at least two businesses back then, plus racing horses and staying up late filling in the financial holes by playing high stakes poker, so Jerry’s duties were vast and not just limited to installing a new ring and piston in whichever Hayden race bike was currently worn out. Earl and Rose were swamped most afternoons so Jerry would make the run across Owensboro to Precious Blood Catholic School and pick up Nicky and the other kids after school. There is an entire biography on Nicky Hayden and you will strain to find any reference to Jerry Clark in it, even though he was a direct witness to Hayden history. That’s probably because Jerry Clark is not a natural story-teller; trying to get him to tell some stories takes the skill of a good locksmith. You will ask him questions for years before he trusts you enough to open the vault. But he remembers. Jerry Clark remembers waiting in the truck for Nicky Hayden to finish class at Precious Blood Catholic School grade school, and seeing him burst out those doors, smiling, ready to go ride motorcycle. “He was always smiling. He was so happy to be out of that school and get home and pull his gear on, go riding,” Clark remembers. Every ten year old kid has dreams: be an astronaut, a hero fireman or win the Indy 500. With Nicky, according to Clark, from about the time he started talking, his sole lifetime goal was to be an AMA Grand National Dirt Track champion. He grew up racing dirt track and slept in hotel rooms with both Gary Nixon and his dad at the races so the GNC dream was a natural. Then one day, young smiling Nicky burst through the school doors trotting to the car with a very serious look on his face. Clark laughs nervously, crazily, like he doesn’t tell this story too often because maybe people will question his sanity. “I think of that car ride now, and I get a little chill, even today, you know?” Clark says. “When he won the world title in 2006 I thought of that day in the car coming home from school. It was like … I didn’t know to laugh or cry. It was just … wow.” Today Clark can be found … same place he’s been for a few decades now. Freshening up the Hayden brothers practice bikes. Fast forward to mid-season 2015. Indy is next week, and this may be Nick Hayden’s last USGP appearance. Maybe a new Nicky Hayden adventure in another championship beckons for 2016. What? Nicky Hayden’s last MotoGP race in the USA? There won’t be much fanfare–no tearful good-bye speeches, no parade laps. That’s never been Nick’s style. Life has blessed him and he knows it. Think about it: how many people can say they achieved the goal they set for themselves at age 10?